First application of 100 grit polish to floors. Home repair store after 4-step concrete polish. After concrete polish system is applied to floors. After concrete polishing system has been applied to floors. Restore the gloss to your concrete floors with Shorewood’s advanced polishing technology. This complete polish and maintenance system provides coating-free wear, stain, and etching resistance while reducing maintenance costs. Shorewood’s system has many advantages beyond traditional concrete polishing, both in the initial polish and in a continued system of floor care. Improved gloss appearance and durability. Greater stain and etch rejection. Take an active role in maximizing the stain and etch rejection of their floors. Continue to densify and harden their concrete floors, extending the life of the polished appearance. Drastically reduce natural concrete dusting, helping to maintain an overall cleaner and safer environment. 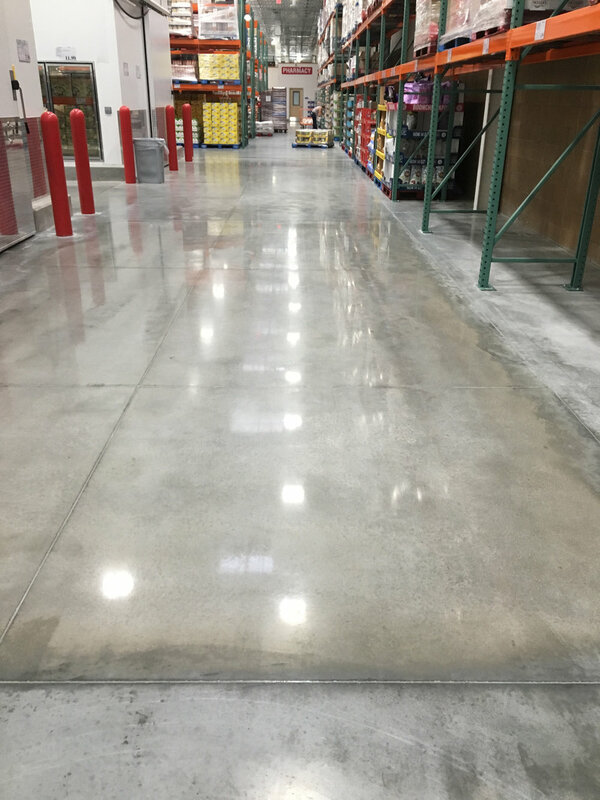 This revolutionary approach to concrete floor polishing makes durable and glossy concrete floors simple and easy, maximizing maintenance efficiency and providing visual appeal to any facility.